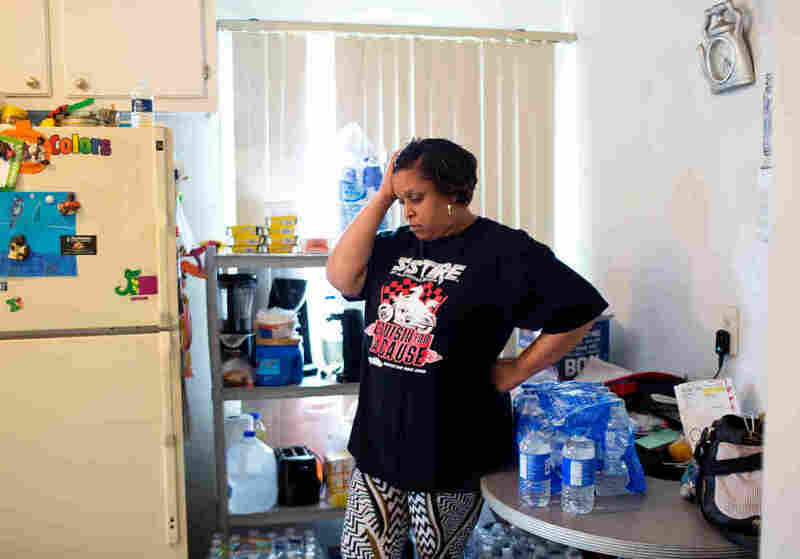 When Every Drop Of Water Could Be Poison: A Flint Mother's Story For Flint resident Jeneyah McDonald, using bottled water for everything has become an onerous but necessary routine. Still, she worries about the effects that toxic tap water will have on her sons. Jeneyah McDonald stands amid cases of bottled water in the kitchen of her home in Flint, Mich. Before water donations arrived in Flint, McDonald says, she spent an estimated $100 out of her $300 weekly grocery bill buying safe water for her family. The problems with high lead levels in Flint, Mich.'s water started in April 2014, when the city switched water sources and began drawing its supply from the Flint River. The new water was harder, and government officials allowed it to corrode the city's pipes, leaching lead and other toxins into the tap water. Even though the city switched back to its original supply in October 2015, the damaged pipes continue to contaminate the water, and Flint's nearly 100,000 residents don't know when the water will be safe to drink again — even though they're still paying for it. Jeneyah McDonald and her family are among those who are affected. All Things Considered met them on a recent reporting trip and will follow up with them in the months and years to come. It's early in the afternoon on a cold, wintry day, and Jeneyah McDonald is preparing a dinner of baked chicken with baby lima beans and rice for her family. The Flint resident moves smoothly around her small kitchen, able to cook without even thinking — except when she finds herself reaching for the kitchen faucet to turn on the tap water. The small habit she once took for granted could now be dangerous. McDonald pours from a gallon of spring water to rinse vegetables while preparing a meal at her home in Flint. She uses at least 2 gallons of water each day to cook dinner. Her 6-year-old son, Justice, plays nearby. "What did I tell you about that water?" she asks. Government negligence allowed lead and other poisons to get into the water. Now, nobody knows how long it will take until it will be safe to drink from the tap again. For families like the McDonalds, giving up tap water means changing even the smallest of their routines. So Jeneyah, a substitute teacher, taught her son that the water is poison because, she says, "I don't know any way to explain to a 6-year-old why you can't take a bath anymore every day, why you can't help Mommy wash the dishes anymore ... and that way he'll know I'm serious, don't play with it, even if I'm not looking." Jeneyah's dinner recipes all have a new ingredient these days. She says she has been using bottled water so long, she knows how many it takes to fill each of her pots. For the small one she is using to boil the lima beans: two. For a bigger pot, like the one to make spaghetti: seven. 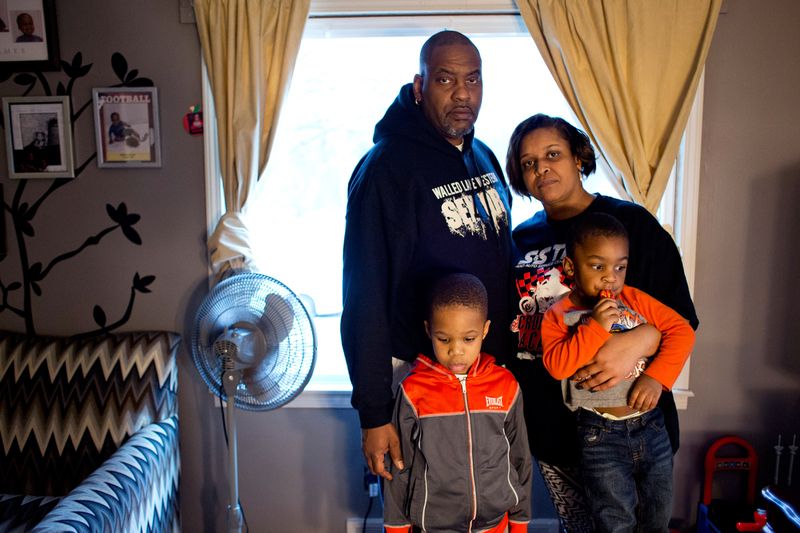 Earl and Jeneyah McDonald pose for a portrait with their sons Justice, 6, and Josiah, 2, at their home in Flint. The McDonalds have had to teach their sons that the water is poison and not to go near it or use it. Twisting open the bottle caps is time-consuming and sometimes painful for her arthritic hands. But she doesn't trust the city-issued water filter for her kitchen faucet, so she puts up with the pain to ensure her two sons are drinking uncontaminated water. As she waits for the water to boil, 43-year-old Jeneyah recalls her childhood, when bottled water was a luxury and she could drink straight from the water hose. She doesn't think that will ever happen in Flint again, not for her anyway. "I will never trust this water ever again," she says, shaking her head. "My boys will never experience the childhood I experienced in Flint, drinking water out of a water hose." It all started two years ago, when the city switched its water supply. 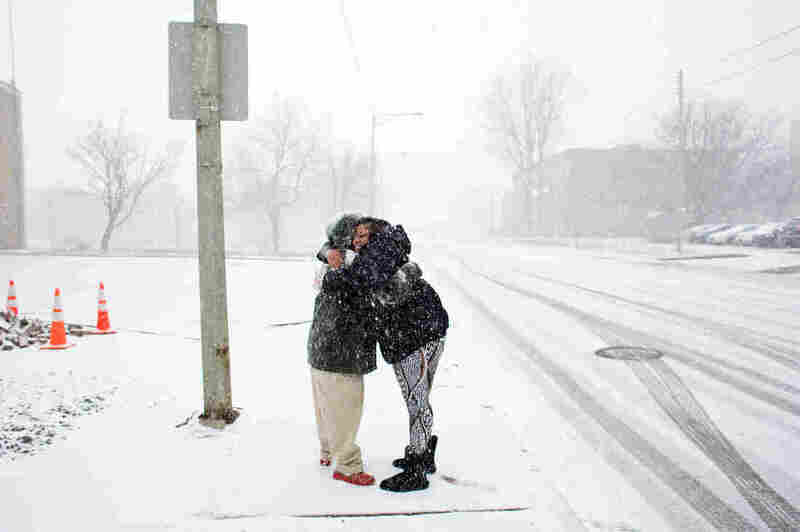 Jeneyah, like many of Flint's residents, immediately knew something was wrong. The water was a funny beige color and smelled like sewage one day, like a swimming pool the next. Eventually, she started buying bottled water, on top of paying a water bill every month. It was expensive. At the time, Jeneyah was working at a homeless shelter. Her husband, 42-year-old Earl, was unable to work owing to a disability. "My food bill for a week would be upwards of $250 to $300, and at least $100 of that was water," Jeneyah says. "No food stamps, no assistance, just having to do what I have to do because I have to keep my boys safe." The family practically went broke buying cases of bottled water, she says, and even that wasn't enough to protect her and her family. After weeks of showering in the tap water, Jeneyah found her hair coming out in clumps. She used to be known for her long, flowing hair. "It's gone," she says. "That was part of me." Now, she has a short bob. 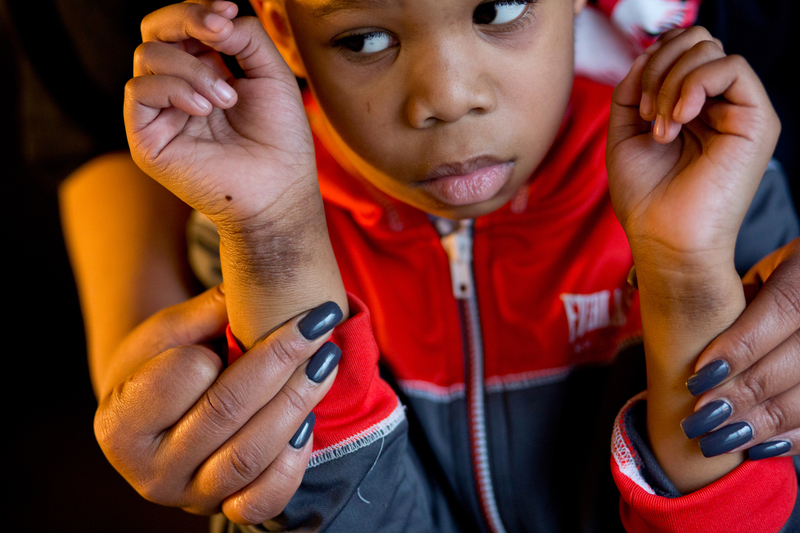 McDonald holds 6-year-old Justice's wrists to show the eczema he developed three years ago. It's unclear whether the water caused the eczema, but his mother says it does aggravate the condition, because the rash never calms down or goes away fully. Even so, she doesn't worry so much about her hair. What she really worries about is the damage to her sons. Six-year-old Justice has eczema, dark rashes on his wrists and chin where he says "maybe a bear scratched me." His doctor has prescribed him medicated creams and ointments, but none of them seem to be working. The rashes persist. In Flint, there's no way to know whether the eczema or the hair loss comes from the water or something else. Two-year-old Josiah has problems, too. Lead poisoning can lower young children's IQ and slow their development, something that's constantly on Jeneyah's mind. She remembers filling his baby bottles with formula made with water from the tap, and she feels guilty, as if she should have done something sooner. "Even now, I can see slower developments in Josiah. And, you know, who's to say it's not from the water?" she asks. 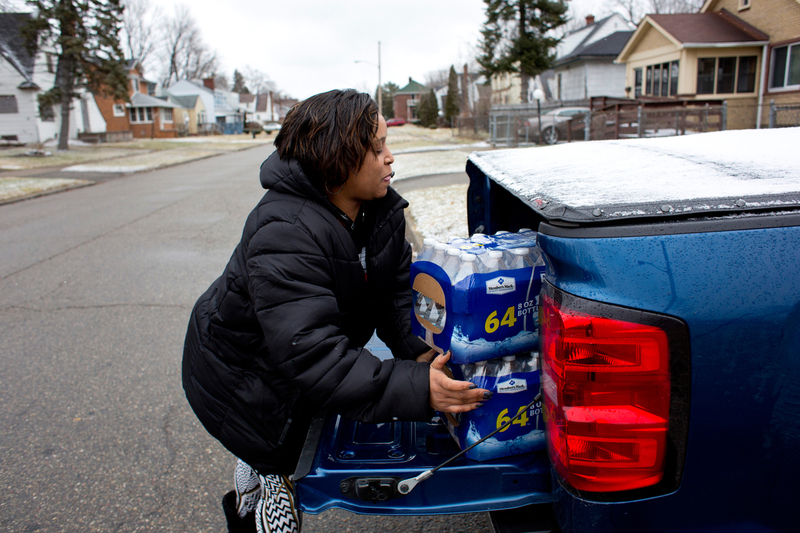 McDonald unloads cases of bottled water to take to her godbrother Brent Diggs, who is handicapped and often unable to pick up water himself, at his home in Flint. So in an effort to keep the water from harming her boys more, her and her husband's daily routines now include rounds of water pickups. On this afternoon, Jeneyah finishes seasoning her chicken, covers it with foil and puts it in the oven. With the lima beans on the stove to cook, and the rice ready to go after, she puts on her boots and coat and heads to her truck. Her first stop is Triumph Church. She likes coming here because they give based on how much each family thinks it needs. A church volunteer approaches Jeneyah's window, and asks how much water she wants. "How many can I have?" Jeneyah asks. "About five or six of them?" "Sounds good to me!" the volunteer responds. Other volunteers load the bed of the truck with six cases of water, each containing a couple of dozen half-liter bottles, donated from people all over the country, as far away as California. McDonald hugs Tyrone Knight, a previously homeless veteran, after spotting him walking along the road while she was out on a water run. She met Knight while trying to find him housing during her time working at My Brother's Keeper, a homeless shelter in Flint. "That's amazing," Jeneyah says. "I'm proud of us, human beings. I was not liking humans for a while there!" Next stop is a firehouse, where National Guard troops in their camouflage fatigues stand in front of large pallets of bottled water. Here, the water comes from the government — and the troops limit the amount each person can pick up. Two cases at one firehouse, a couple of gallons at another. It's not enough, Jeneyah says, not for a family of four. She also likes to keep a small stockpile of water, just in case. If one of her children spills something or has another accident, it can take as many as seven cases for a bath. If a snowstorm hits or she's unable to make her rounds, her family needs enough backup to get through a few days. It takes her about an hour to hit all the stops each day, and she has no idea how many weeks or months this daily routine will have to continue. "Is this America?" she asks. "I am stupefied that I'm not in, like, Ethiopia or somewhere. You're talking about clean water." Back at home, she unloads the cases of water and opens another two bottles to boil some rice, the smell of baked chicken pungent in the air. Her sons play in the other room, a children's television show in the background. She worries that the donations will stop coming as people pay less attention to Flint, that government help for the boys will stop once the immediate crisis subsides. "They look OK today. What will they look like in five years? In 10 years?" she wonders. "And, at that point, where will all of these government officials be then, when I am dealing with the repercussions of that water?"